If nothing else, Game of Thrones has conditioned us to think "winter is coming" means things are about to get real miserable. Which isn't really fair to winter. Granted, for some people the three months after the Christmas tree comes down are about shoveling snow, filthy cars, and dealing with obnoxious Snapchats from people in Florida. But in the right locales, winter can be the best time of the year. As one of said obnoxious Snapchatters in Florida, cold weather and I do not jive. But this year I got up to Canada to experience the season in Quebec City and Montreal, and after seeing how they've taken something cold and gray and filled it with light, music, and joy, it made coming back to the sunshine a little bit of a letdown. If you can handle even a bit of nip in the air, you owe it to yourself to make it to either of these cities before spring -- preferably with someone you like to keep close, to stay warm. 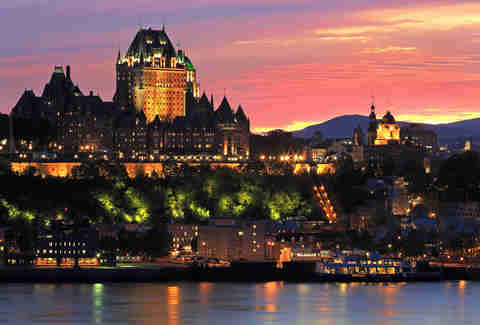 Quebec City is the Frenchest place I've ever been, and that includes France. The winding, rickety streets lined with brick buildings and pitched roofs look like an opening sequence of Beauty and the Beast. Add a foot or so of snowpack and a light fall of snowflakes, and it starts to feel like a much colder Disneyland. North America's only walled city north of Mexico is a marvel of architecture and history. But the locals know full well that not even a charming old town is going to coax people outside in the occasional minus-35 wind chill. So in 1955 the city created a sort of iced-down Mardi Gras called Carnaval de Quebec. It has now grown in a national cultural touchstone that Canadian children learn about in school, right between French grammar and overt politeness. 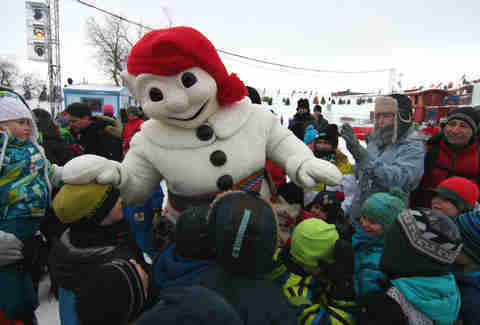 The traditionally three-week event dominates the streets of Quebec City, where stuff like human foosball, a massive waterfront bobsled, and dozens of public ice rinks are presided over by a giant talking snowman named Bonhomme (more on him later). Carnaval isn't just a fun little street party to help people forget it's going to be face-shearingly cold for the next eight weeks. It's an outdoor celebration where a downtown public rink shines with colored lights and an amped-up DJ, turning what might otherwise be a frozen frostscape into a highly air-conditioned South Beach. It's rolling down a sheet of ice inside a giant inflatable bowling ball trying to knock over inflatable pins. It's doing a shot of Jager off a shot-ski, then learning proper axe-throwing technique from an actual French-Canadian lumberjack. Carnaval is about turning the dreariest months of the year into a nonstop stream of fun, making a lame old beach in Florida seem kinda basic. If Carnaval de Quebec celebrates one thing, it's Bonhomme, the official mascot whom Canadians revere like a second Santa Claus. Imagine how every 5-year-old reacts the first time they see Mickey Mouse. Now picture grown men who probably played semi-pro hockey reacting the same way. This is how Canadians react when they see Bonhomme. Though he walks throughout the carnival, he's most often found inside his epic ice castle, a structure made completely of ice blocks that lights up in neon at night in the center of Downtown. When I dropped in, the strange snow mascot asked me, "And where are you from?" like a department store Kris Kringle inside his ice castle. Despite looking a little like a severe burn victim with a nice scarf, he bellows heartily in a thick Quebecois accent. "Flow-ree-dah??" he said like so many snowbirds I'd waited on as a South Beach bartender. "Well, you must be very cold!" He laughed in the way only a captain of the obvious who entertains children can. I smiled and took a selfie, then let the rest of Quebec City have their turn. It took a few Caribous -- the official drink of Carnaval, made up of port wine and whiskey -- to get up the courage to screech down the side of Quebec City's 133-year-old ice slide, which runs along the St. Lawrence River. Trips down can top out at over 40mph, and racing down it is as much a part of Canadian winter as pickup hockey. But as I went head-first down the slide, adrenaline pumping harder than it had all winter in Miami, I realized what an amazing season winter is. And living in Florida meant I was missing out on a lot. Quebec City had an energy I'd never seen before for winter. The world gave Quebec City snowstorms; they built an ice castle in the middle of Downtown, put a bar next to it, and invited people to throw axes. When a blizzard hits, they take the party to the streets. Giving winter the same cheery middle finger they give to every Florida driver who dares to honk at their horrendous driving. Nothing quite screams "winter" like hearing Paul Newman dubbed in Quebecois French talking about "old-time hockey" as a freezing wind rakes across your face. So standing on the end of the Old Port of Montreal behind two guys dressed up like the Hanson brothers for a subarctic outdoor screening of Slap Shot gave me a new appreciation for the sheer creativity Montreal has with the cold. Any place can have summer outdoor movie nights. But creating a veritable Rocky Horror Picture Show experience for the greatest hockey movie of all time? 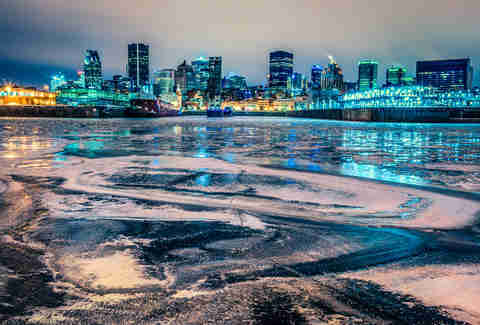 THAT is why Montreal has crafted itself into a destination equally fantastic in winter or in the summer. As the dubbed Quebecois version of Slap Shot (far more vulgar than in English, btw) played on the giant screen, guys dressed as characters from the movie slugged beers and posed for selfies. Meanwhile the audience yelled along with some of the movie’s more memorable quotes. I now know how to say highly unprintable stuff in French Canadian. The film is part of the annual Igloofest, a sort of cold-weather Ultra where EDM fans pack the Old Port for three weekends of raving outside in frozen-solid temps. "The idea," says organizer Francois Fournier, "is that people have to dance to stay warm. You can’t just stand around here, or you’ll freeze." As the movie ends, the Ogie Ogilthorpe jerseys leave and the DJs come on as a new audience emerges in front of the stage. Atop the catwalks surrounding the pier, the crowd glows bright purple, then green, then floodlight white as the 350-year-old waterfront behind it illuminates with their shadows. The buildings behind them are capped with snow, and the pulsing bass line makes the whole scene feel more like somebody had a little too much brandy and decided to throw a whopping street party, rather than North America's biggest cold-weather outdoor music festival. But dance they do, because in Montreal, winter doesn't mean the party has to stop. The 1980s and '90s saw Montreal slip from the financial center of Canada into a deep depression, as the Quebecois separatist movement spooked some of Canada's biggest banks and corporations to relocate from Montreal to Toronto. But it has reinvented itself in the 21st century through development of performing arts, plus a slew of famous festivals. The big names -- Just for Laughs, Cirque Montreal, and the Montreal Jazz Festival -- are all in the summer. And since Eastern Canada isn't exactly a tropical wonderland, the city realized it needed to draw people in the winter to have a viable tourism economy. Igloofest has been a big part of that, as have sports. In Montreal, people don't sit inside and put on a "winter layer" like in some colder US cities. They're active, and lacking much alpine terrain, they've also gotten creative. For example, the province of Quebec has an entire ice canoeing TOUR, wherein teams navigate the province in canoes on the frozen St. Lawrence River. Though that's more of a spectator sport, it's a spectacle you won't see elsewhere. Montreal has an entire outdoor public curling stadium, lit up like a nightclub with pounding electronic music as part of Montreal en Lumiere. There's even a "Polar Hero" race where contestants run a 10K through 50 obstacles over a frozen course. The city supports an annual neighborhood hockey tournament, featuring teams from all over the city playing on public rinks. And dotted through public squares you'll find small ice slides blasting rock and electronic music, so any time of day an impromptu ice party might break out. It was during one such impromptu slide party I realized that you don't need to take pictures of your feet in the sand to enjoy the month of January. Yeah, Florida is nice, but there's something to doing things in the cold that you can't during warm weather -- especially when you keep your pulse up. 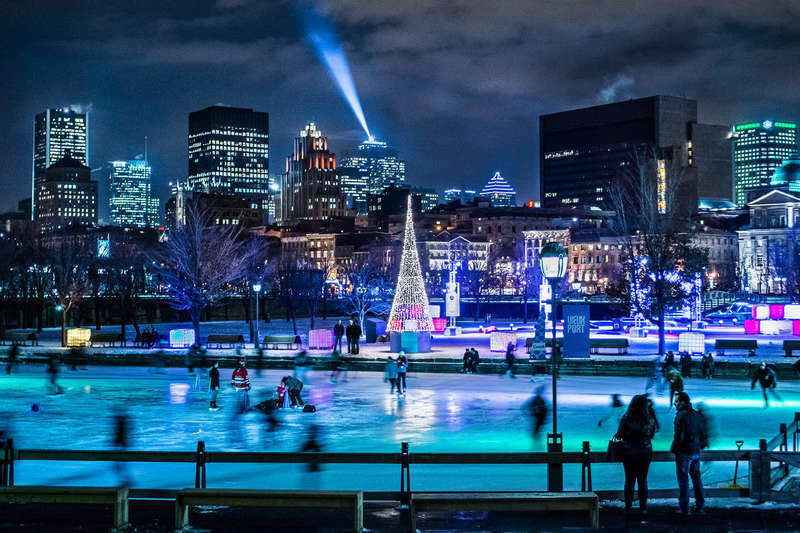 Visiting Montreal and Quebec City in the winter isn't just for warm-weather dwellers who want a change of pace. It's for people who live in colder climes as well, as an example of how to take the frozen months and make them fun. And maybe turn the phrase "winter is coming" into an expression of excitement. Matt Meltzer is a contributing writer at Thrillist who usually doesn't get any colder than a Florida Panthers home game. Follow him on Instagram @meltrez1.